When it comes to sports saloons, there is only one daddy: the BMW M3. Since its introduction in 1985, this wolf in sheep's clothing has proven to be the benchmark for fast four-seaters, and the iconic model is now in its fifth generation. However, the current M3, with its luxurious cabin, twin-clutch gearbox and 1.6-tonne kerb weight, is far cry from the trailblazing original, with some fans of the model decrying its loss of driver focus in the pursuit of wider market appeal. If you subscribe to this "they don't build 'em like they used to" school of thinking, you'll be happy to hear you can now get your hands on a completely unmarked example of the original E30 M3. That is, provided you can cough up the £119,995 its vendor is asking for it. 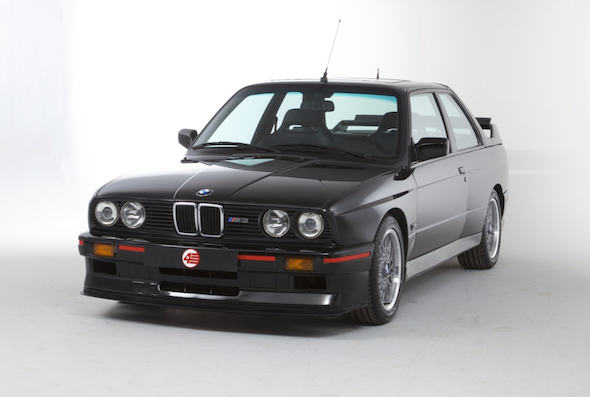 Offered by Hampshire based 4 Star Classics, this particular model is no ordinary M3, but a rare Sport Evolution model. One of only 600 ever to be built, it features a larger 2.5-litre motor developing 235bhp and mated to a five-speed dogleg manual gearbox that sends power to the rear wheels. The car is also fully loaded with every extra, including air conditioning and electric windows, which weren't offered as standard in the name of saving weight. Going a long way to justifying the car's eye-watering price is the time-warp state of the interior. Everything from the uber-cool black sports seats to the dashboard and roof-lining, looks utterly factory fresh and completely unused, despite the model showing nearly 44,000 miles. With prices of E30 M3s rising all the time, £120,000 for what is arguably one of the rarest and best examples available isn't quite as steep as one might imagine, and the car could prove to be a sound investment. And, anyone who would shun a brand new Aston Martin Vantage in favour of a classic Beemer definitely gets our thumbs up.